Solid-For use in large engine. Flat or hydro. Use tunnel ram. 11.5:1 compression. Magnum camshafts are very aggressive and specifically designed for the street enthusiast looking for more power with that Pro Street sound. Intended for performance oriented vehicles that will see little street use. The idle characteristics of your engine will change due to the increased duration and overlap of the Magnum Cam Series. You will notice a racey idle with the 282-grind while the 294 and 306-grinds will produce a rough or ''rumbly'' idle. Stock components are generally incompatible. Changes are needed in rear end gear ratios, headers and the torque converter. Comp Cams Magnum Cams will affect your power accessories to a certain extent. The 280 and 292-grinds are the biggest cams that should be used with power assisted brakes, air conditioning, etc. You should remember that the bigger the engine is, the less the cam will affect the vacuum which affects your power accessories. The smaller your engine is, the more the Magnum Camshaft will affect your power accessories. Most late model vehicles have a vacuum canister. If your vehicle does not have a vacuum canister, it may be necessary to add one. The 270S Solid Magnum Cam is the perfect cam for small to medium cubic inch engines. The 270S delivers good low speed torque with a moderate noticeable idle. This cam is an excellent alternative to the 268H. The 282S Solid Magnum Cam is great for street machines because it can be driven daily and raced on weekends. 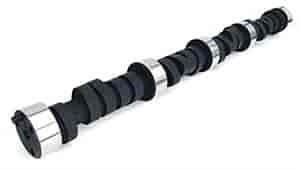 This cam features a broad power curve and torque range with a mild rough idle. The 294S Solid Magnum Cam is a maximum performance cam. This cam should be used in high compression 4-speed cars. The 294S makes great top-end power and works well with ported heads. The 306S Solid Magnum Cam is an excellent grind for large cubic inch Pro-Street type engines. This cam has tremendous high RPM power and needs to be used with headers, intake and higher compression. This cam does not have the advance made into it and will need to be degreed in. COMP Cams 924-16 - Dual Valve Springs I.D.of Outer Dia: 1.125"
COMP Cams 741-16 - 10° Super Lock Steel Retainers Valve Spring Diameter: 1.500" to 1.550"
COMP Cams 930-16 - Dual Valve Springs I.D. of Outer Dia. : 1.150"